In the last six months I have been obsessively writing and making art in tandom – I’ve always written in my studio practice, and amassed a collection of art books that rivals the local bookstore’s art section. I grew up with a modest amount of art in the home, but where I really got my inspiration, where I caught the art bug/the visual as communicator, was through books. I have fond memories of riding my bicycle home from the library with a backpack full of 15 pound art tombs on my back. Yes, there were frequent lapses of balance, and close calls on sharp turns. These days there is a real trend in the combination of art and text, text in art, artists as writers and writers as artists. For the general art viewing public we too are having a heavy text experience when supposedly consuming visual art. While I refuse to read wall labels until the bitter end, and only so that I may research the artist further, we are inundated with text everywhere when viewing art. It doesn’t surprise me then that last weekend in New York there were many exhibits dedicated to books, to text, and to artists who have made their careers playing with text. It seems a natural extension that we would be looking to shine the spotlight on this “type” of art. 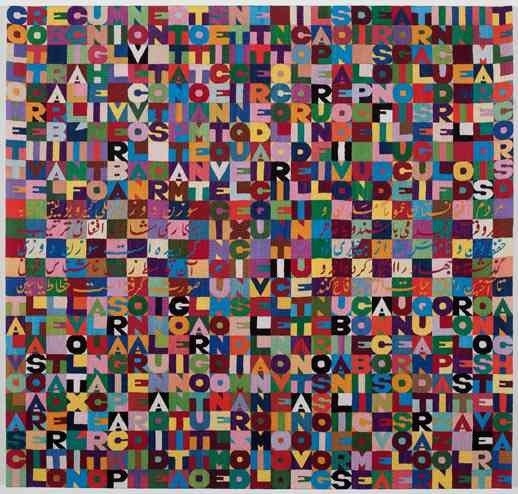 My favorite was an exhibit at Gladstone Gallery of Alighiero Boetti’s “La Forza del Centro“. 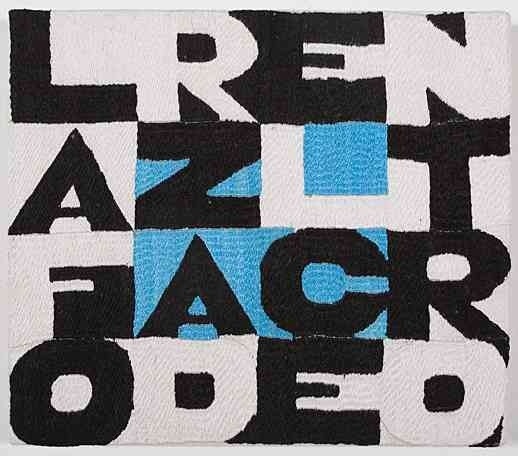 Firstly Boetti’s history in the Arte Povera movement has an urgent feeling today – the movement stressed the use of everyday materials with a mission to deconstruct consumer capitalist society. So yes, all the work in this very commercial gallery was not for sale, it is part of his foundation. Secondly, this particular project was a collaboration (also quite relevant today) with weavers from Afghanistan (most definitely relevant). The work was executed in 1980s and 90s. The works are called Arazzi and Arazzi grande. The works are beautiful mixtures of cryptic text, with messages and poetry in both Farsi and Italian. The work is both formal and playful. Another exhibit of eye candy, with a dose of conceptual, but mostly pretty was Airan Kang’s “Luminous Words” at Bryce_Wolkowitz_Gallery. 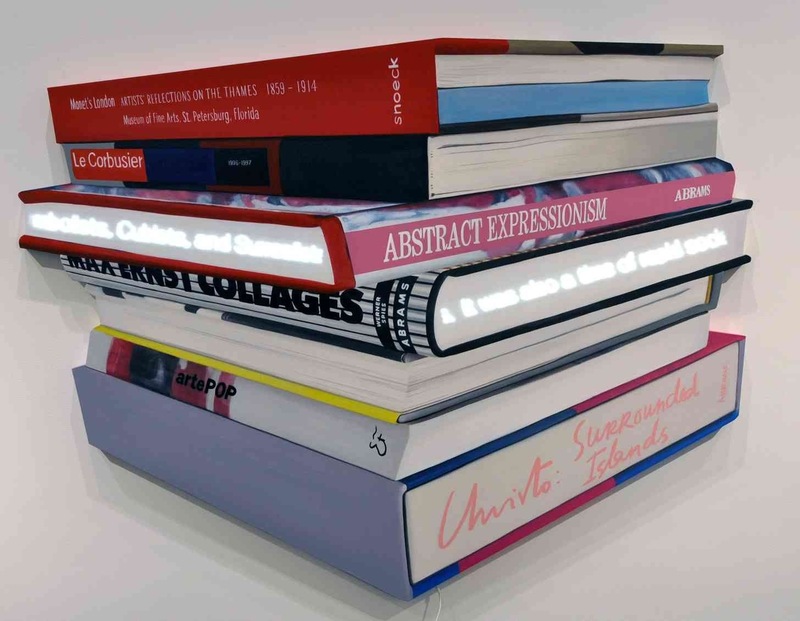 Her sculptures are paintings of books plus an LED screen with moving text. They are stacks of books, all art books. The funnest pieces are the large, seething piles of books where your eye dances around attempting to recognize the books that your too may have on your shelf. The artist is from Seoul, Korea, though the aesthetic definitely appeals to the earnest American – generally Americans tend to enjoy looking at work that “looks like it took so much time and work!”. Which indeed, the book sculptures have been painted carefully by Kang, and clearly took a lot of time and effort. There are also some bookshelves she’s made of brightly illuminated books, to remind the viewer perhaps that its the content that makes the book glow, or is it the covers luminosity that makes the book? You can be the judge. “Modern Art”, acrylic on canvas, LED, image courtesy of the artist and Bryce_Wolkowitz_Gallery. 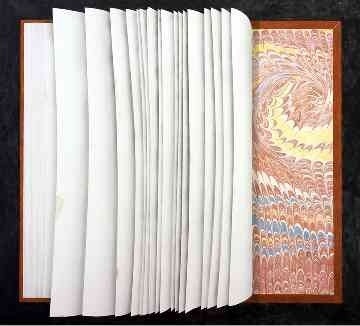 At Gagosian Gallery in Chelsea there was an exhibit of painted books by Ed Ruscha. Ruscha’s work is widely known by his simple, conceptual and playful use of text. This exhibit is about the book specifically. 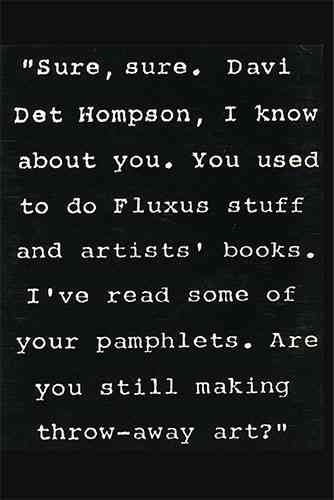 Ruscha admittedly does not read much, but loves books as objects. He’s made many conceptual books in the past, books tethered not by words, but by thematic images (e.g. gas stations, a street in LA). He made these books early in his career because they were inexpensive to produce, and a way to get his work circulating. Ed Ruscha,”Fanned Book”, 2012, Acrylic and charcoal on canvas, Photo by Paul Ruscha, image courtesy of The artist and Gagosian Gallery. After making the requisite visit to Printed Material (artists who love books haven) and picking up a book for my artist book collection (Alfredo Jaar’s homage to John Cage), I landed at the ZeiherSmith Gallery where they had a wonderful exhibit up of Davi Det Hompson. This Fluxus artist was known for selling “words” – This would be the aesthetic opposite of the aforementioned Korean artist’s work. The display was really fun, with his words framed on tall pedestals resembling a crowd of chatty gallery goers. ZeiherSmith collaborated with an art/book store Division Leap in Portland on this too – a bi-coastal show of Davi Det Hompson – my word! 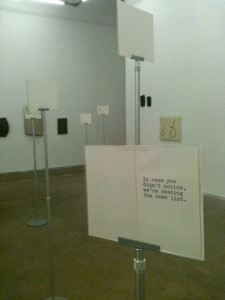 Image of installation of “Sure, sure. Davi Det Hompson…,” 1991, at ZeiherSmith Gallery. “Sure, sure. Davi Det Hompson…, 1991”, printed carstock, published by Bound and UnBound, New York, image courtesy ZeiherSmith Gallery. You can imagine that heavy text-based art is sure to inspire the intellect. However the mental gymnastics of deciphering the seen versus the spoken versus the pictured can be exhausting. It leaves me needing an intermezzo, a palette cleanser of sorts. Instead of art that tickles the mind, maybe indulging in one that hits the heart – one of stillness and weight.